Every backcountry skier in Salt Lake spends a fair amount of time monitoring our digital weather vanes, such as NOAA’s Cottonwood Canyons forecast and the Wasatch Snow Forecast. We then compare notes with skiers on online forums and the daily reports from the Utah Avalanche Center regarding where conditions are safe and where they’re creamy, wind-affected, Styrofoam-y, dense, crème brûlee ice, or fluffy. One term all we weather-watchers dread: high pressure front. This prolonged break between storm cycles happens even in the best of winters, although our winters have seemed to dish up slimmer pickings lately (thanks, global warming!). High pressure fronts do a lot to wreck the air quality in the Salt Lake Valley. Dirty air gets trapped in a blanket of cold along the valley floor, accumulating for days or weeks until the next big storm clears everything out. And for skiers and riders, it’s a double-whammy: The snow surface is subjected to all manner of unholy things ranging from warming and crusting to chilling and hoaring. It’s a messed up world out there, between storms anyways. 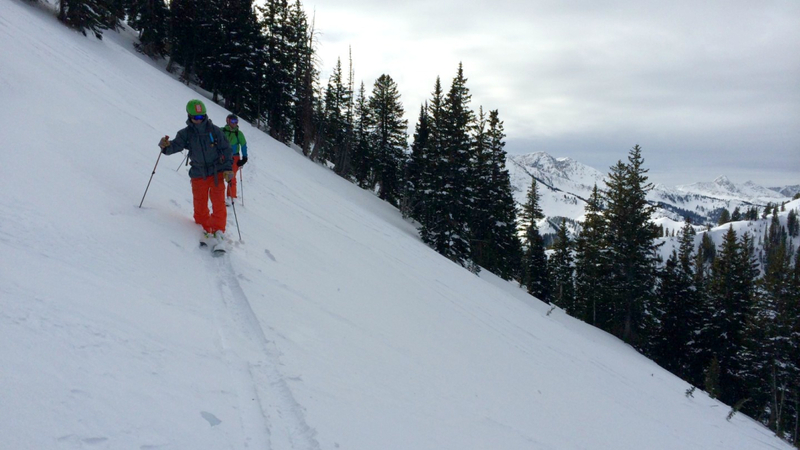 Fortunately, while we fight global warming and Salt Lake air pollution (which both unfortunately feel like long-term campaigns), there are a few hidey-holes where intrepid skiers can find decent snow when everything else has gone to funk. You’ll want to calculate based on time of day, temperatures, and skier traffic, and of course, consult the avalanche forecast. 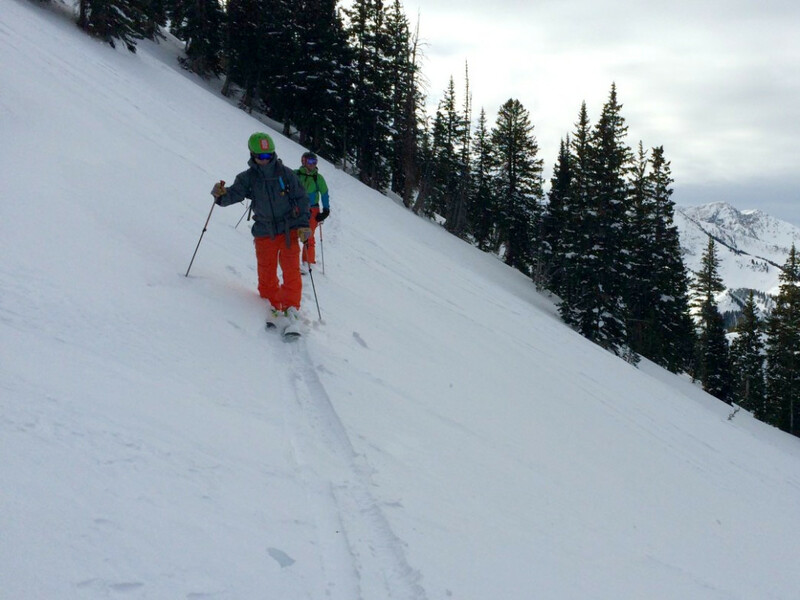 The spots below offer sheltered terrain at mid- and high elevations that, when timed right, can yield excellent returns for your skinning investment. Green’s Basin is a little-known delight that’s more fun for skiers than snowboarders, given the rather flat skate back to the car after your descent. But for anyone willing to brave this short little skate, the rewards are ample. 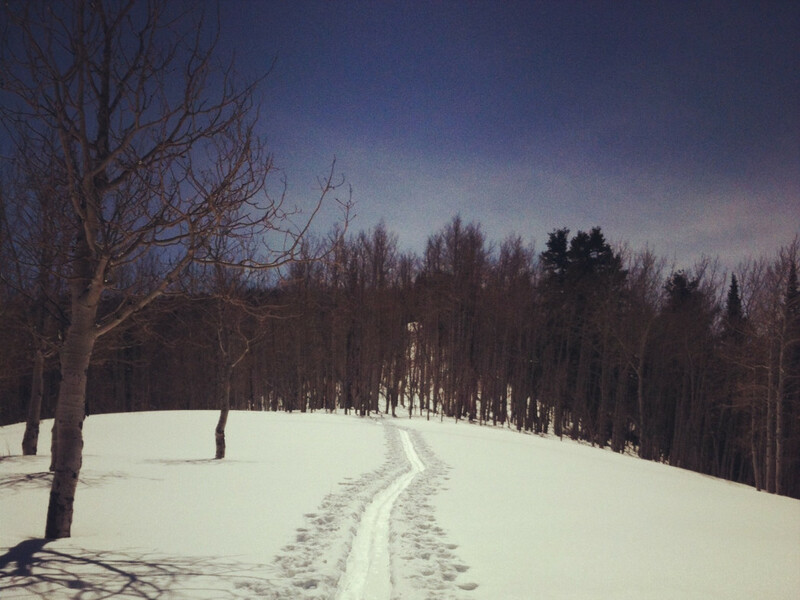 It’s well suited for advanced skiers and riders who don’t mind very steep tree glades. But the basin’s steepness, flats at the bottom, and lack of widespread popularity all mean the masses stay away and the snow quality stays good. Green’s Basin is a little north-facing nook tucked between Silver Fork and Day’s Fork in Big Cottonwood Canyon. Its slopes are blanketed with trees and rarely see direct sunlight. Snow stays pristine and protected from baking and wind-scouring. And even better—the ascent is short and direct from the Spruces parking lot. This makes it a great tour when time is tight. Start skinning up Day’s Fork but hang a left just 20-30 minutes up the skin track. (You should see a clear turnoff.) After another 30 minutes, you reach a flat meadow. Start switchbacking up the ridgeline southward as far as you’d like to go from here. Stay in the Green’s Basin bowl on your descent; at times it’s steep, but the drop-offs are few. Resist the temptation to drop off the ridgeline into Day’s Fork proper; this descent line is riddled with wide, sloping cliff bands no mortal should huck. Silver Fork’s upper bowls are known to many, but there’s plenty to go around. Skiers can access these powderful basins by hiking Fantasy Ridge above Solitude or skinning via the Twin Lakes Pass area from either Solitude or via Alta’s Grizzly Gulch . It’s a relatively quick jaunt either way. Fantasy Ridge is a great way to go if you have a Solitude season pass, know what you’re doing, and have no fear of heights. Otherwise, stick with a skinning option. Both Grizzly from Alta and Highway to Heaven from Solitude are quick, easy ascents. From the top of Davenport, you can poke around to assess the best aspect for your descent. The safest bet when the snow elsewhere is showing its age: Go for the direct north-facing trees off the hilltop. The initial descent is as quick as it is wondrous, so you can easily skin back up and lap it as many times as you like. To get back to Alta, drop back the way you came from the Davenport ridgeline into Grizzly. To get back to Solitude, just go the rest of the way down the gut of Silver Fork. You’ll end up at a short, snowpacked road a quarter-mile skate from Solitude’s Eagle Express lift. Pink Pine is a short, easy, relatively safe tour—one of the mellowest in Little Cottonwood, in fact. So while it offers lovely north and northeast facing tree glades for good sheltered skiing, the rest of the ski crowd is onto the little secret. The solution? Hit it early in the morning soon after a storm cycle ends. The trail’s lower-canyon views look even better when illuminated by a sunrise glow, so you’ll see Pink Pine at its prettiest. After another quarter-mile or so, you’ll arrive at another turnoff to the left, located at the toe of a ridgeline that ascends between White and Red Pine gulleys. Take this turnoff and head up the ridgeline as long as you like. Most people go up about 500 feet from here, although you can go farther for more vertical. For your descent, there are a few superb options. The likely best bet when the snow isn’t brand-spanking-new is to head northeast down the wide-spaced tree slope into White Pine. You’ll link back up with the skin track you came up. As always, for any of these tours, go equipped with avy knowledge and a beacon, probe, and shovel. The Utah Avalanche Center offers a comprehensive daily forecast. And to help your route-finding, download the Wasatch Backcountry Skiing map to your phone—it’ll tell you exactly where you are on a topo map of ski routes in the Cottonwood Canyons. Think You Could Paddle the Longest Canoe Trail in the Northeast?